Composite front cover of his newspapers. Joseph Pulitzer (April 10, 1847 - October 29. 1911) was an Hungarian-born American journalist and publisher, who competed with William Randolph Hearst in late 1800s as both created a more sensational form of newspapers. In contrast with Hearst, the originally St. Louis-based Pulitzer supported labor, criticized big-business monopolies, and sought to expose political corruption. He attempted to raise the standards and reputation of journalists by founding the Pulitzer Prizes for exemplary articles and books. Pulitzer's will established the Columbia University School of Journalism, and annual Pulitzer Prizes for journalism, literature, drama and music, which have been awarded since 1917. The prize has occasionally been criticized for going to leftist and sometimes even fraudulent works. Mr. Pulitzer was born In the village of Mako. near Buda Pesth In Hungary, on April 10, 1847. He came to the United States at the age of seventeen. In 1864. He was enrolled In the First New York (Lincoln) Cavalry, at Kingston, on September 30, 1864. was mustered out at Alexandria, Va., June 5, 1865, and soon after resumed civil life In St. Louis. His father had been a successful grain merchant in Hungary, but he died when Joseph was eleven and his mother remarried a few years later. After emigrating to the United States, Joseph fought in the Civil War on the side of the Union. In 1868, after being engaged In various occupations, he became a reporter on the Westllche IPost. His enthusiastic Interest In journalism and his Inexhaustible energy soon bore their fruit. He became managing editor of the Westllche Post, then part proprietor. In association with the late Carl Schurz; and, on December 10, 1878, after ten years' experience as a journalist, he bought the St. Louis Dispatch, united It with the Evening Post, then owned by the late John A. Dillon, and founded the Post-Dispatch, which remained his property until the day of his death. In 1869 Mr. Pulitzer was elected a member of the Missouri Legislature; and three years later he was a delegate to the Cincinnati Liberal Republican Convention, which nominated Horace Greeley for the Presidency. In 1874 he was a member of the Missouri Constitutional Convention. In 1880 he was a delegate to the Democratic National Convention and served on the Committee on Platform. He was elected from New York to the Forty-ninth Congress for the term 1885-1887, but resigned after a few months' service. For the last forty years of his life Mr. Pulitzer was an independent Democrat, In the broadest sense of the term. Unsuccessful in his first business, Joseph began working as reporter and acquired part ownership of the Westliche Post, a German-language publication. He became a state legislator in Missouri, and in 1877 he married a niece of Jefferson Davis, Kate Davis. His big break in publishing came when he purchased the New York World in 1883 from Jay Gould. Pulitzer enjoyed great success with that newspaper, both politically and financially. But when he reached 40 years old, he tragically became blind, though he continued to run his newspaper companies. In the 1890s he competed directly with William Randolph Hearst, and turned to "yellow journalism" to boost circulation: utilizing shocking headlines, sensationalism and cartoons in an attempt to attract immigrants and working class readers. Mr. Pulitzer purchased THE WORLD In May, 1883. At that time the paper was controlled by Jay Gould; It had a circulation In New York of less than 10,000 copies; It was practically bankrupt; and It exerted very little Influence. It posed as a Democratic organ; but It was a pose which deceived neither Its owners nor Its readers. "The entire WORLD newspaper property has been purchased by the undersigned, and will from this day on be under different management — different In men. measures and methods — different In purpose, policy and principle — different In objects and Interests — different In sympathies and convictions — different In head and heart. "Performance Is better than promise. Exuberant assurances are cheap. I make none. I simply refer the public to the new WORLD Itself, which henceforth shall be the dally evidence of Its own growing Improvements, with forty-eight dally witnesses In Its forty-eight columns. "There Is room In this great and growing city for a journal that Is not only cheap but bright, not only bright but large, not only large but truly democratic — dedicated to the cause of the people rather than~that of purse potentates — devoted more to the news of the new than tne old world— that will expose all fraud and sham, fight all public evils and abuses — tbat will serve and battle for the people with earnest sincerity. "In that cause and for that end solely the new WORLD Is hereby enlisted and committed to the attention of the Intelligent public." . JOSEPH PULITZER. " THE WORLD grew rapidly under Mr. Pulitzer's hand; the quarters on Park Row, opposite the Post-Office, were extended and enlarged, only to be hopelessly outgrown. Mr. Pulitzer, on April 10. 1888. bought the historic French Hotel property, at the corner of Park Row and Frankfort Street, and the following year began to erect the Pulitzer Building, where THE WORLD Is now published. Here again he was a pioneer, for he was the first New Yorker to use the steel skeleton construction In a large business building. His four-year-old son, Joseph Pulitzer, Jr., laid the corner-stone on October 10, 1889, as part of Imposing ceremonies, but the founder and proprietor was absent. From a sick-bed at Wiesbaden he had cabled his message to his beloved paper and the people. In 1908 the Pulitzer Building was doubled In size to accommodate the greatest newspaper plant In existence. In 1895 Pulitzer ran the first full-page original original cartoon, called "Yellow Kid" and designed by cartoonist Richard Outcault. The cartoon itself was not in the style of "yellow journalism," but its popularity led to the cartoon's name being used to describe the entire style of its paper. Outcault later moved to one of William Randolph Hearst's newspapers, the New York Journal. Both Pulitzer and Hearst played a prominent role in inciting the Spanish-American War in 1898, as they were engaged in a circulation struggle that led to the sensationalism about the war. However, today liberal accounts and school textbooks almost entirely blame the pro-business Hearst for causing that war rather than the more liberal-leaning Pulitzer. The taxation of Inheritances. The taxation of monopolies. The taxation of large Incomes. The taxation of the privileges of corporations. A tariff for revenue. Reform of the Civil Service. Punishment of corrupt officeholders. Punishment of vote-buying. Punishment of employers who coerce their employees In elections. These principles Mr. Pulitzer deemed vital to the continuance of Democracy. For them he fought, caring nothing for the furious onslaughts made upon him at times by party leaders. In 1887 Mr. Pulitzer suffered a complete nervous breakdown. This was followed by the gradual loss of his eyesight; and for the last twenty-four years of his life he was almost completely cut off from personal association with men and affairs. His time was spent chiefly at Bar Harbor, at Jekyl Island, Ga., and on the Riviera, with long periods of yachting. During the past three years he lived for the greater part of each year on his yacht Liberty, a boat specially built to suit his needs. Here, surrounded by a staff of secretaries, he kept himself Informed of everything that passed In the world from which he was shut off by his Ill-health and his blindness. The energy, persistence and enthusiasm which had served him so well In the day of his strength served him still better in the day of his weakness. He elaborated a system under which, through the agency of his personal secretaries, nothing escaped him. The news of the day reached him through a score of papers; a hundred weekly and monthly magazines paid their toll to his Insatiable Interest In current affairs; history, biography, fiction, drama, and music occupied the hours which were not devoted to the control and guidance of THE WORLD. Although Mr. Pulitzer maintained to the end a keen Interest In everything which concerned THE WORLD, his chief solicitude was centred In the editorial page, as the expression of the paper's conscience, courage and convictions. To that he devoted Infinite care and attention. Sick or well. It was never wholly absent from his thoughts. When he was well he had it read to him every day and expressed his opinion about every editorial article, the style In which It was written, the manner in which the thought was expressed, whether the editorial was strong or weak, whether It served any useful public purpose, whether It said the thing that a great newspaper ought to have said. When ill health made It Impossible for him to have the editorial page read every day, he would keep the files for weeks, and then when his condition permitted he would go over them with painstaking care, always from the point of view of a detached critic, seeking only to determine whether the page was taking the fullest advantage of its opportunities for public service and whether it was measuring up to the high standards that he had set for it. Nothing was ever allowed to interfere with its independence and its freedom of expression. There were certain questions about which he became convinced that In spite of all his efforts he was possibly prejudiced. In these matters he exacted a pledge that no suggestions or instructions or even commands from him would ever be followed, but tbat the paper would always say what an Independent, untrammelled newspaper ought to say lu performing its duties to the people. This pledge was never violated, and nobody respected tt more tenaciously than he himself, even when he was aggressively unsympathetic with the attitude the page sometimes assumed toward the Issues in question. His passionate jealousy of the editorial integrity and Independence of THE WORLD knew no bounds. For that he was ready to sacrifice everything. Including himself. As a journalist, Mr. Pulitzer was guided throughout his career by a few simple and direct principles. His aim was to make a newspaper that would print all the news that ought to be printed, wlthput fear or favor; that would present this news In such a manner as to appeal to the widest circle of readers; that would fearlessly attack all forms of wrong and Injustice; that would safeguard the weak, restrain the strong and be a great forum of popular self-government; that would hold itself beyond every form of Influence except that of the public welfare. To this end he concentrated all his energy and all his genius. 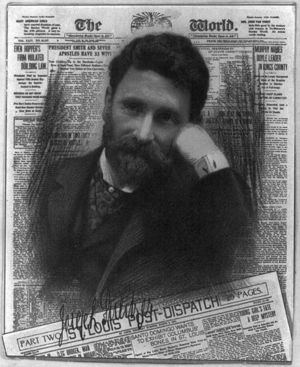 Driven by the force of his convictions, Mr. Pulitzer created a new kind of journalism, and by means of It he became the great emancipator of the American press. He found It shackled to tradition, to systems and to parties. He struck off Its shackles and showed it the way to freedom. He was the first of the great editors to regard a newspaper not as private property, but as public property — not merely as affected with a public Interest, but animated and Inspired by public Interest; Independent of everything except public Interest — Independent even of Its own proprietor, when occasion required. "God grant that this structure be the enduring home of a newspaper forever unsatisfied with merely printing the news — forever fighting every form of wrong — forever Independent — forever advancing In enlightenment and progress — forever wedded to truly Democratic Ideas — forever aspiring to be a moral force — forever rising to a higher plane of perfection as a public Institution. "God grant that THE WORLD may forever strive toward the highest Ideals — be both a dally schoolhouse and a dally forum, both a dally teacher and a dally tribune and Instrument of justice. a terror to crime, an aid to education, an exponent of true Americanism. "Let It ever be remembered that this edifice owes Its existence to the public; that Its architect is popular favor; that Its corner-stone Is liberty and justice; that Its every stone comes from the people and represents public approval for public services rendered. "God forbid that the vast army following the standard of THE WORLD should In this or In future generations ever find It faithless to those Ideas and moral principles to which alone It owes Its life and without which I would rather have it perish." Three days after Mr. Pulitzer had assumed control THE." WORLD attempted to raise funds by a popular subscription to build a pedestal for the Bartholdl Statue, the beautiful and colossal bronze figure given by the people of France to the people of America as a token of endearing friendship between two liberty-loving nations. The American committee had failed to arouse the public from apathy as to the project, and the press sneered at the situation. THE WORLD'S early efforts also failed, as Its limited circulation did not reach the masses, which It was confident would respond when called upon to aid so patriotic and worthy a cause. Twenty months later, on March 16, 1885, It again took up the work with energy, being able to appeal to thousands where It had before appealed to hundreds. The rich remained Indifferent and failed to contribute, but In four months, through THE WORLD, the people gave more than $100,000, which represented the free-will offerings of 120,000 men, women and children. With this money was built the noble pedestal on which "Liberty" has stood for twenty-five years at the gate of the nation's metropolis. The Inauguration ceremonies on October 22, 1886, were attended by President Cleveland and his Cabinet, the Governors of many States, members of the diplomatic corps, and many distinguished American guests; also by a notable deputation from France, Including M. Auguste Bartholdl, the statue's creator; Count Ferdinand de Lesseps, Admiral Jaures, General Pellssler and other high representatives of French official and civil life. There was a naval parade In the harbor and a huge land parade, the latter being reviewed by President Cleveland and the French guests at Madison Square. On Bedloe's Island, the site of the statue. Count de Lesseps, on behalf of the Franco-American Union, made an address. Senator William M. Evarts made the presentation speech and President Cleveland the address of acceptance. In 1895 Mr. Pulitzer proved that the bond policy of President Cleveland was Inimical to the Interests of the people. He did not hesitate to show the President's error. It was announced from Washington that the $100,000,000 Issue of 4 per cent. bonds had been sold In bulk to the Morgan syndicate "at about the same price" paid for an Issue of $63,300,000 worth the year before. The country was shocked, for THE WORLD pointed out that these bonds, sold to the same syndicate at 104%, were quoted on the market at 118 or more, and the new bonds would surely bring as much. The sale, as planned, would not only Involve a great loss to the Treasury, but the very suggestion rapalred the national credit at home and abroad. THE WORLD printed "An Appeal to the President." It showed him the' nature of the blunder he was making, and entreated him to abandon the arrangement and "trust the people." It pledged Itself to take $1,000,000 worth at the highest market price and stood alone for fourteen days In defense ofjthe nation's honor and credit, printing dally from thirty to forty columns of arguments and appeals. It sent messages to 10,370 bankers In all parts of the country. It received 7.130 replies, offering to take more than $300,000,000 In bonds at the market price. That settled It. President Cleveland rejected the syndicate's contract. The "bond ring" was smashed. The bonds were offered at public sale.fand the people bid for almost six times the amount of the Issue, or, to be precise, wanted to buy not $100,000,000 worth of bonds, but $558,269,850. More than 800 bids at 110 or better were received, where Mr. Morgan had offered only 104. The head of the smashed syndicate betrayed the "deal" by bidding 110.6877 for all or any part of the Issue — $6,000,000 more than his syndicate would have paid under the "arrangement." The whole Issue was disposed of at an average price of nearly 112, netting $6,888,836 more to the Treasury than would have been received had the secret deal been conummated. THE WORLD kept Its promise, taking $1,000,000 worth of the bonds and paying $1,130,000 In gold for them. On history's pages will ever be written the name of Joseph Pulitzer as that of one of the bravest most persistent and most Influential champions of the cau^e of International arbitration. Mr. Pulitzer detested war which might be avoided. The consistency of THE WORLD In Its never-ending fight against jingoism and the splendid results of sticking to Its colors was demonstrated In 1895, when stern duty to Itself and to humanity compelled It to Instantly and passionately oppose President Cleveland's attitude in the Venezuelan crisis. It saw his serious error and the unhappy consequences to which It might speedily lead. It mattered not that THE WORLD had done so much toward twice making Mr. Cleveland President. His message to Congress had aroused a war clamor contrary to reason and common sense, and there was grave danger that America and Great Britain might become engaged In conflict. The voice of the jingoes here and in England grew dally louder — raving for war — because of a boundary dispute between Venezuela and Great Britain. THE WORLD called the message "a grave blunder," and declared that Cleveland had falsely Interpreted the Monroe Doctrine. He had asked the Senate for a commission to settle the dispute which he had not been asked to settle. Mr. Pulitzer appealed to the sanity and common sense of the people, and THE WORLD sent 500 cable and telegraphic messages to the leaders of thought In the British Isles and In America. Next day It published responses from the leading public men, prelates and statesmen of England, messages of peace and good will. Gladstone said: "Only common sense Is necessary." The then Prince of Wales, later King Edward VII., forsook traditions of royal etiquette and addressed a friendly message to America through THE WORLD, expressing his hope of a peaceful settlement of the Imbroglio. Peace was restored, and the plaudits and thank offerings of the whole English-speaking race poured In upon Mr. Pulitzer and THE WORLD for staying the hands of the two nations just ready to imbrue them In each other's blood. Mr. Cleveland's Venezuelan Commission made no report. The dispute was arbitrated, "and England and America joined In organizing an International Court of Arbitration. THE WORLD'S service In averting "bloody war" was recognized by the Peace and Arbitration Societies of Great Britain, and In evidence of the gratitude of that portion of the English-speaking people who live In the British realm for that service these societies waited upon Joseph Pulitzer, then In London, and presented an address to him, Cardinal Vaughan being the spokesman. Of THE WORLD'S flght Joseph Chamberlain said: "THE WORLD led public thought when it secured expressions of opinion from the leading men of America and Great Britain. It performed an Inestimable service to the English-speaking people of the whole world." Following Its splendid victory In the cause of peace and arbitration In the Venezuelan boundary controversy, THE WORLD was the guiding spirit in an effort to avert the South African conflict In 1900. On September 27, 1899, President Kruger, in THE WORLD, summed the issues from the Boer viewpoint and alleged that the crisis was due to certain British residents "to whom the very existence of the republic Is an eyesore," and who, not content with the best mining laws In tne world, wished also to have complete control of legislation and administration, the destruction of the republic, and complete control of the richest mines In the world. He concluded sadly that "we have no such powerful friend as you proved to be to Venezuela and other republics. "We have strong faith that the cause of freedom and republicanism will triumph in tne end." THE WORLD cabled President Kruger's message In full to Joseph Chamberlain, British Secretary for the Colonies, who was quick to reply with a reference to the British Blue Book for his side of the controversy. President Kruger answered through THE WORLD that his Government had ever been ready to submit the dispute to arbitration, and suggested that a board of arbitration be selected, two members by England, two by the Transvaal, and the fifth by the President of the United States or the President of Switzerland, concluding with: "We have yielded everything but the life of the republic. We wish most earnestly for arbitration to prevent a war which would be an outrage against religion and humanity." THE WORLD Immediately set going the movement for arbitration, which resulted In the most powerful petition ever drawn to President McKlnley, asking him to offer the kindly offices of the American Government In mediation of, the dispute, which had reached a* stage that threatened the existence of two sister republics. President Steyn, of the Orange Free State, cabled his grateful Indorsement of THE WORLD'S effort for peace and urging the necessity for speedy action. Premier W. R. Schrelner, of the British Cape Colony, cabled from Cape Town his appreciation and sympathy with the movement for a peaceful settlement of the South African difficulties. Archbishop Croke cabled: "Avert war by all honorable means." Cardinal Logue said: "I am most anxious for peace." "The republics are determined that if they must belong to England a price will be paid which will stagger humanity." In view of Mr. Pulitzer's attitude toward arbitration for nearly three decades It was natural that only a few months before his death he was still pleading, to use his own words spoken In 1896, for "the reign of reason against the reign of force." THE WORLD vigorously supported President Taft and Ambassadors Bryce, of England, and Jusserand, of France, In their efforts to complete negotiations for lasting peace between America, Great Britain and the United States. In its issue of August 3, 1911, THE WORLD said editorially: "To-day in the East Room of the White House in Washington a treaty insuring perpetual peace between the two nations through an agreement to submit all questions of difference to arbitral process will be signed on behalf of the United Kingdom and the United Stales. At the same time a similar treaty between France and the United States to ill be signed in the Foreign Ministry in Paris. Both treaties have yet to be ratified, but it is scarcely conceivable that the hope of humanity will be dashed by any failure to take this final step. This, therefore, is a memorable day in the history of three great nations. To THE WORLD it brings the welcome fruit of ceaseless agitation for more than a quarter of a century to the end that wanton slaughter and destruction shall no longer be invoked in the settlement of international disputes." To Mr. Pulitzer the word "democracy" was sacred and represented principles and never party In the partisan sense. In 1884 Mr. Pulitzer, realizing that a turning point In national history had been reached, and that opportunity for success was knocking at every true Democratic door, had, before obtaining control of THE WORLD, steadily urged In his St. Louis Post-Dispatch the nomination of Cleveland. The new WORLD, dally gaining Influence In New York, found Itself bitterly opposed In Its Cleveland attitude by John Kelly, of New York, Tammany Hail and others to whom the Independence of Governor Cleveland was decidedly distasteful. Nothing daunted. THE WORLD threw down the gauntlet and followed Its challenge with a vigorous battle for Cleveland's nomination. John Kelly declared that Tammany Hall would not attempt to help elect Cleveland If he was nominated. THE WORLD said Kelly did not mean what he said and continued its fight. When Samuel J. Tilden was the Democratic leader and Cleveland was Mayor of Buffalo THE WORLD had picked Cleveland as Tilden's logical successor and as a Presidential candidate, and it did not propose to strike Its colors to Tammany. Kelly's threat, however, had Influenced delegates from other States, as Kelly was the New York leader, and they felt that success In New York was a vital necessity. THE WORLD took upon Itself the task of disproving Kelly's statement, exposed the pretense that Tilden opposed Cleveland, and brought forth every Item of evidence to show that Cleveland, by his steady Independence of the party bosses, had made himself the strongest man In the State before the people. Writing to the twentieth anniversary number of THE WORLD, Mr. Cleveland said: "I never can lose the vividness of my recollection of the conditions and Incidents attending the Presidential campaign of 1884, how thoroughly Republicanism was intrenched, how brilliantly It was led, how arrogant It was, and how confidently It encouraged and aided a contingent of deserters from the Democratic ranks. And I recall not less vividly how brilliantly and sturdily THE WORLD then fought for Democracy; and In this, the first of Its great party fights under present ownership, It was here, there and everywhere In the field, showering deadly blows upon the enemy. It was steadfast In zeal and untiring In effort until the battle was won; and it was won against such odds and by so slight a margin as to reasonably lead to the belief that no contributing aid could have been safely spared. At any rate, the contest was so close it may be said without reservation that if it had lacked the forceful and potent advocacy of Democracy at that time by the NEW YORK WORLD the result might have been reversed." It was THE WORLD that overthrew Insurance corruption In New York and led to Insurance reforms throughout the nation. As a result, many millions of dollars have been saved to widows, orphans and other dependents. THE WORLD brought to New York the blessing of subway traffic to "Harlem in fifteen minutes." after nearly twelve years' persistent fight. It has ever since battled for extension free from monopoly. THE WORLD killed the Ramapo water stSal. THE WORLD exposed the Ice Trust. THE WORLD exposed the armor-plate frauds. Single-handed and alone, THE WORLD exposed and stopped the scandalous deal between the McKlnley Administration and the Union Pacific Railroad reorganizers by which, on October 22, 1897, Attorney-General McKenna announced the Government would sell the Union Pacific and Kansas Pacific for $50,000,000 to satisfy their debt to the Government. THE WORLD exposed and denounced the job, organized a new syndicate, and forced the pool to pay $58,000,000 for the Union Pacific and $6,303,000 for the other road, a saving of $14,000,000. THE WORLD forced the New York Central Railroad to establish the block system. THE WORLD stopped cruelty and Brockwaylsm In Elmira Reformatory. THE WORLD killed the Louisiana Lottery octopus. THE WORLD created the Franchise Tax law of New York State. When Gladstone was leading the battle for Irish home rule, THE WORLD raised a fund from 11,000 contributors for a magnificent memorial of solid sliver to the "Grand Old Man." In presenting the gift to Mr. Gladstone, Mr. Pulitzer designated It as "an evidence that there Is an Irrepressible sympathy between the liberty-loving masses which Is more sincere than that of rulers." The Weekly Payment bill, passed by the New York Legislature after a vigorous fight In behalf of the measure by THE WORLD, brought relief to millions of wage-earners, and was In fllne with THE WORLD'S work for Saturday half holidays, its support of the eight-hour movement, and other beneficial and remedial efforts in aid of tolling humanity. THE WORLD'S crusade against sweatshops resulted In the passage of the Anti-Sweatshop law by the New York State Legislature. THE WORLD was the first to propose the revival of the naval rank of Admiral, extinct for a generation, and to advocate that that distinguished rank be conferred upon Commodore George Dewey, whose victory at Manila and subsequent government of the conquered Philippine city practically settled the war with Spain and insured the independence of Cuba. When Lord Mayor Tallon, of Dublin, and John Redmond, M. P., visited America and appealed on behalf of the Irish people for assistance In paying off the long-overdue mortgage] upon the home of the late leader and idol of the home rulers, Charles Stewart Parnell, THE WORLD joined in the work, and in three days more than enough money was raised, and the home of Ireland's greatest leader of modern days was saved. The first poll of Congress, showing that the Sherman Silver law would be repealed, was taken by THE WORLD on June 17, 1893. A majority of 175 members of the House were pledged over their own signatures to THE WORLD to vote for repeal. The publication of this poll had a quletine effect, the country being threatened with a financial panic, resulting from a senseless scare rather than from Insolvency or Inflation. Under these circumstances THE WORLD decided to ascertain from presidents ol the leading banks of the country the exact facts as they saw them. The result was a long series of statements, published by THE WORLD June 3. What the country at large thought of the situation was shown from what bank managers in a score of cities In the South and West had to say about It. THE WORLD sent a correspondent, Nellie Bly, rushing around the globe In 1889 In 72 days 6 hours 11 minutes and 14 seconds to show that the imaginary record of Jules Verne's Phlleas Fogg could be beaten. The trip oaused great excitement, and THE WORLD received nearly a million guesses as to when the Intrepid voyager would reach home. When Stanley emerged from the African wilderness the first man to meet him was a WORLD correspondent, and the first news of the explorer's return to the confines of civilization was sent by him. THE WORLD'S mission to Africa was twofold — to meet Stanley and to make a thorough Investigation of the African slave trade. Both of these objects were successful, despite extraordinary difficulties which beset the effort. During the Boxer troubles In China THE WORLD vigorously denounced Secretary Root's declaration on July 19. 1902, when he said: "No matter what action is taken by the powers, the troops of the United States will remain In China." THE WORLD insisted that as our Minister and our other citizens shut up In Peking were rescued, our army had accomplished Its mission, the object for which alone It was sent, the only excuse for Its presence in China was gone and there was left no reason why a single American soldier should stay on Chinese soil. It should withdraw, leaving China to restore her disordered affairs. When peace was restored our Government could arrange for Indemnity and reparation. On September 22, 1902, President McKinley bowed to public opinion, voiced by THE WORLD, and In his reply to Germany, Russia and China he announced a policy of peace, justice and civilization: peace through Independent negotiation. For more than a quarter of a century THE WORLD has advocated the graduated Income tax on the ground that It is fair, simple, understandable and democratic. Ceaselessly It has waged war for the measure.which represented one of Joseph Pulitzer's declared principles when he took possession of THE WORLD. It was, therefore, a proud day for this paper when, on July 12. responding to the pressure brought by THE WORLD, Gov. Dlx and some of the other Democratic leaders of the State, the New York Assembly adopted, 91 to 42, the resolution Indorsing the Imposition of a Federal Income tax. The measure already had passed the Senate, and thus, with the Assembly's sanction, it only was necessary to transmit it to the Department of State in Washington. A majority of the States Is now practically assured in favor of the tax. Mr. Pulitzer commenced this fight five days after he assumed direction of THE WORLD. He declared It to be "the fairest and most democratic tax a government can Impose." and said: "An income tax exempting incomes below $4,000 or $5,000 could not touch anybody to whom payment could be a serious burden." Many newspapers and Individuals denounced this new idea as revolutionary and socialistic. THE WORLD, however, patiently and forcefully urged It as "essentially a people's tax," and slowly but surely the proposition grew In popular favor, until, eleven years afterward, President Cleveland signed a law providing for just such an Income tax as THE WORLD had advocated for more than a decade. The friends of this law praised THE WORLD for having secured Its passage by Congress, and the enemies of the new statute were severe In their criticism, blaming THE WORLD for their defeat, and thus paying It a high compliment. The United States Supreme Court, by a vote of 5 to 4, declared the law unconstitutional. Subsequent Congresses were hostile to a revival of the measure In constitutional form, but THE WORLD'S attitude remained unchanged. It continued Its battle. On August 2, 1909, Alabama went on record as the first State In the Union to give her Indorsement to the sixteenth amendment to the Constitution of the United States, to wit" "That Congress shall have power to levy and collect taxes on Incomes, from whatever source derived, without apportionment among the several States, and without regard to any census or enumeration." THE WORLD led the press of America In the fight for reciprocity with Canada as a first step lu levelling the Payne-Aldrlch tariff. THE WORLD began. In December, 1910. Its canvass In behalf of Immediate tariff revision. That was before there was any recognized prospect of the reciprocity negotiations bearing fruit. The people responded to THE WORLD'S call, and through Its columns concentrated their opinions upon President Taft and his advisers. How the American side of the battle for reciprocal relations was won and how Canada later refused to enter Into such relations nsed not be rehearsed. All the Incidents are still clear In the public's memory. Thousands recognized THE WORLD as a potent factor In pushing the trade treaty through two Congresses. Leaders In both houses of Congress praised THE WORLD for the part It played. So recently did Joseph Pulitzer crown his newspaper career with a glorious and successful fight to sustain the liberty of the press that It Is not essential to here do more than state the facts In the Panama libel cases. Early In 1909 President Roosevelt, In a special message to Congress, denounced THE WORLD because It had called for a Congressional Investigation of the purchase of the Panama Canal. Mr. Roosevelt Informed Congress that certain statements printed In THE WORLD "are wholly and In form partly a libel upon the United States Government," that the proprietor of THE WORLD "should be prosecuted for libel by the Governmental authorities. and that "the Attorney-General has under consideration the form In which the proceeding against Mr. Pulitzer shall be brought." THE WORLD Instantly declared: "The real Issue Involved In this case Is not one that affects merely THE NEW YORK WORLD. It Is not an Issue that affects merely the freedom of the press. It affects freedom of speech as well and reaches out to the constitutional rights of every citizen of the United States." The entire country was quickly agitated through THE WORLD'S furious onslaught upon the vicious precedent in this Government attempt to muzzle the press. On February 17, 1908, the Grand Jury of the Supreme Court of the District of Columbia Indicted THE WORLD, Joseph Pulitzer and two editors of THE WORLD, charging criminal libel. The proprietors of the Indianapolis News were Indicted on similar charges The Government then tried to bring the Indianapolis defendants to trial In Washington and was beaten. Federal Judge Anderson, who dismissed the case, hotly scored the proceedings. Then an attempt to prosecute THE WORLD in New York City failed. Judge Hough holding that the Federal Courts had no jurisdiction In the matter. This decision was sustained by the United States Supreme Court on appeal. It only then remained to dlmlss the indictments In the District of Columbia, which was done on March 31, 1911. Such was the Inglorious end of the attempt of the Roosevelt Administration to establish the doctrine of lese majesty and assert the right of a President to create a national libel law. Education was one of the sacred words In Joseph Pulitzer's vocabulary. No man weighed more accurately than he the meaning of the term In all Its various applications. It was not strange, therefore, that much of his thought, time and money were devoted to educational uplifts. Backing with a magnificent cash donation his conviction that for the profession of journalism men should be especially trained, he announced, on Augus't 16, 1903, a gift of SI, 000, 000 to Columbia University to found a professional School of Journalism, national In scope, and similar to the University schools of Law, Medicine, Mines and others. As an advisory board Mr. Pulitzer named Nicholas Murray Butler. President of Columbia University; Whitelaw Reid, John Hay, St. Clair McKelway. Andrew D. White, Charles W. Eliot, Victor F. Lawson and Charles H. Taylor. Mr. Pulitzer promised another $1,000,000 after the school had been in successful operation for three years. The board named was later enlarged to Include Samuel Bowles, Melville E. Stone and the principal editors of the New York World, Herald, Post, Sun and Times, the St. Louis Post-Dispatch and the Philadelphia Press. Mr. Pulitzer enjoyed until his death the Income of his gift to Columbia. The University authorities are now preparing to put his far-reaching scheme Into effect. The Pulitzer Free Scholarships for boys graduated from public schools In Manhattan and the Bronx have given each year to ten boys a stipend of $250 that they might attain a college education after leaving grammar school. Success has attended this practical philanthropy from Its Inception In 1889. More than two hundred beneficiaries have thus far given good accounts of themselves as students and later in their chosen professions. Joseph Pulitzer died at 1.40 P. M. on board his yacht Liberty in the harbor of Charleston, S. C, on Sunday, October 29, 1911, in the 65th year of his age. Top 10 Pulitzer Prize for History Books of All Time.